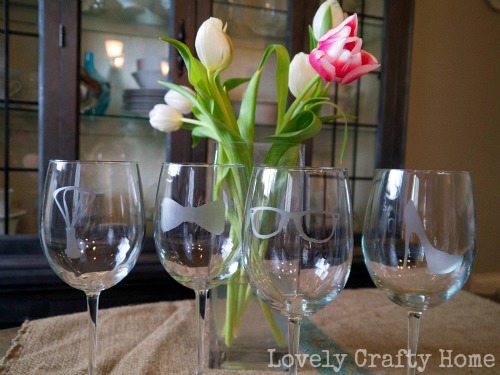 » Glass Etching Success with Martha Stewart! Glass Etching Success with Martha Stewart! I have to admit, I was both nervous and excited when I got the opportunity to try some of the new products in the Martha Stewart glass painting program. I had tried other etching products before and not had very much success. But I knew if there was any product that worked, it’d probably be Martha’s! If you came here looking for a 1-2-3 tutorial, sorry. I’m going to bare my soul to you right now, with Martha as my witness. You know I like to keep it real here on LCH, so believe me when I tell you that a lot of times I struggle with projects. I try a lot of new things, sometimes things that require me to learn new skills. I’m proud of that. I got some pretty advanced skillz, yo. If you thought the scissors would be my biggest problem though…well let’s just say that stenciling in general is my Achilles heel. It’s like all of my weaknesses combined- hence all the confessing. This is something I’m really embarrassed about, but I’m going to just say it out loud (well, in writing) and be glad that I can’t hear you laughing. I have absolutely no understanding of negative space. 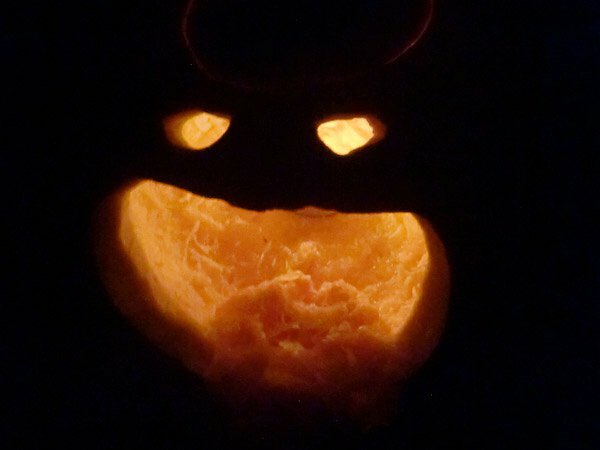 The giant gaping hole serving as a mouth was actually what happened when I tried to carve the “E.” With a stencil I printed out, mind you. Basically, I can’t visualize the parts you’re supposed to leave and the parts you’re supposed to cut. My friends felt bad for me and carved out some eyes and put some pumpkin guts in the “mouth.” Then it was dubbed “The Vomiting Pumpkin.” Are you crying for me yet? 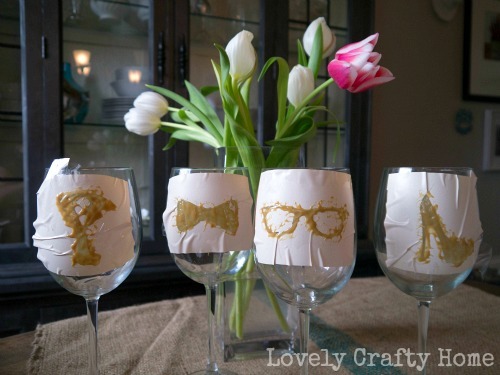 So, when my friend Amy and I decided to etch some wine glasses for our friends-and-fellow-bloggers The 20 Somethings…let’s just say I let her do the cutting. 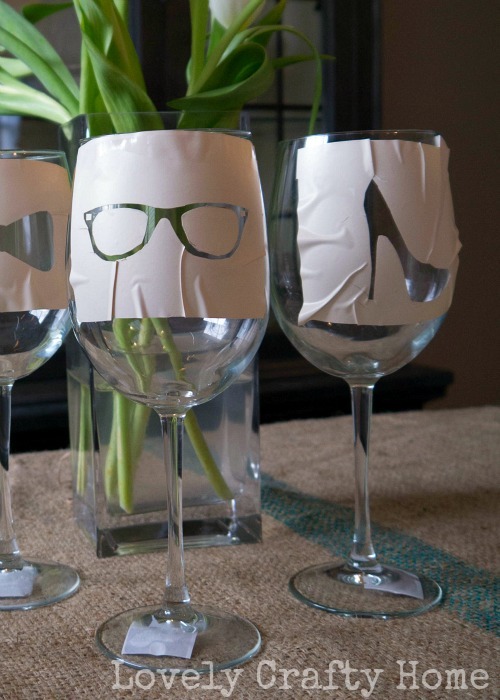 We wanted to etch their blog logos onto each glass (each shape represents a person) as gifts for inviting us to a fabulous dinner party. 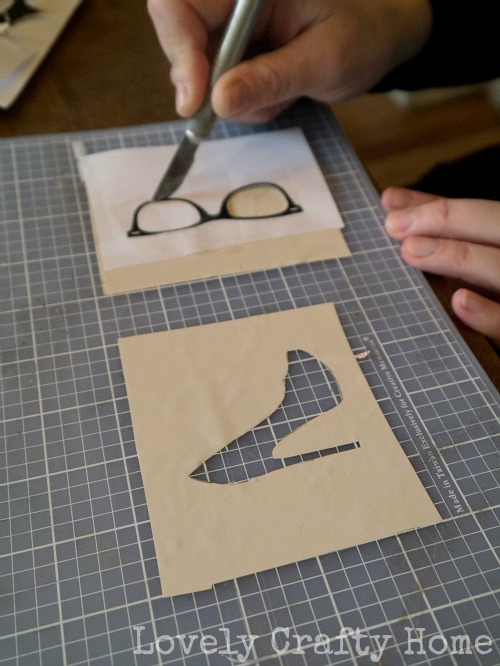 We found the shapes online, cut them out, and traced them onto contact paper. If it sounds easy, that’s because it is…just not for me. Admittedly the shapes we picked were kinda detailed, but Amy was able to handle it with the utility knife. 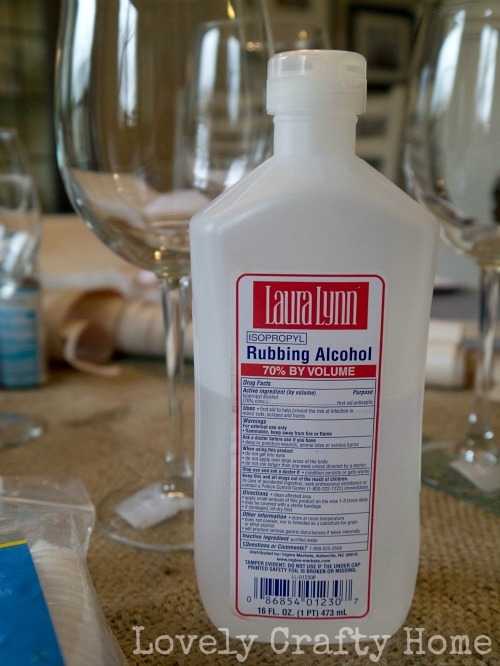 While she was doing that, I cleaned all the glasses with rubbing alcohol per the directions. …and applied the etching cream with a brush. Basically you want an even and fairly thick coat. We left it on for 30 minutes, then I rinsed it off under warm water (with the stencil still on) until it was gone! Easy peasy. So freaking cute, right? The Martha Stewart glass etching cream totally works! 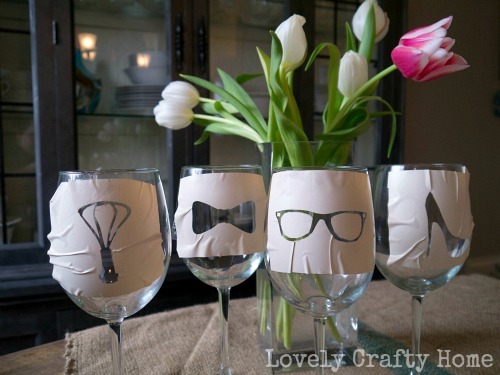 I’ll definitely be using it again, maybe next time with some easier, pre-made stencils But the glasses were a total hit! Have any of you tried this product yet? Or do you have any overly personal details about your crafting skills you want to share? I wrote this post as part of a sponsored campaign with Plaid Enterprises and The Blueprint Social. The opinions in this post are my own. So cute! And we love them. THANK YOU! Those came out so cute. I have never done glass etching before. I went and checked out the link to the Glass program. Im loving the colored glass. I had no clue. Thanks for the info. Wow! I’ve been afraid to try the etching process to. But not anymore, on my way to Hobby Lobby with a coupon in hand. Hope they have it! Thanks for another great Tute! I think I’ve got to try this product!